Home › Creativity › It’s a Guest! We interrupt our normally scheduled blogpost to bring you the following short story by guest blogger Shoshy Ciment. Thanks for filling in this week, Shoshy, while we continue to unpack our computers. Enjoy her short story! You can follow her on twitter @shoshanaciment. There it is. That oh-too-familiar sound of utter panic that can only result from a word as F-O-R-M-I-D-A-B-L-E as Boeotia. I can hear the shifting of a thousand gears desperately searching for time where this word might have shown up, whether it be 4:00 AM study sessions or recess spelling workouts in the library. This is the sound of months of training and sleeplessness spiraling downwards at an E-X-P-E-D-I-T-I-O-U-S pace. I feel lucky that I am not the one who has to spell this beast, and judging by the ebbing of the continual twitch from the boy on my left, he is too. But I can’t say the same for the kid quavering in his double-knotted Chuck Taylors at the microphone trying to discern whether he’ll die of panic, or at his tiger mother’s angry hands. “Could I have the definition, please?” Sweat drips freely down his furrowed brow. And cue the mental breakdown. Sure, he’ll nonchalantly walk off the stage and shrug his shoulders, but everyone who knows what he has been through these past few months will know that inside that small boy, a storm of depression and years of therapy is rapidly brewing. This is the nightmare that he, and thousands of other A-S-P-I-R-A-N-T-S like him have been dreading. This is the bloodbath that is the spelling bee. I remember my first spelling bee as vividly as the smell of a corpse. It was raining that day, and I could hardly see out the misty windows of the crowded convention center. Every time my turn came around, my stomach clenched and my mother closed her eyes and did some P-E-C-U-L-I-A-R last minute prayer. I had never been exposed to the spelling monsters of regionals and nationals that lay outside of classroom bees before this point. But nevertheless, I found it fascinating. 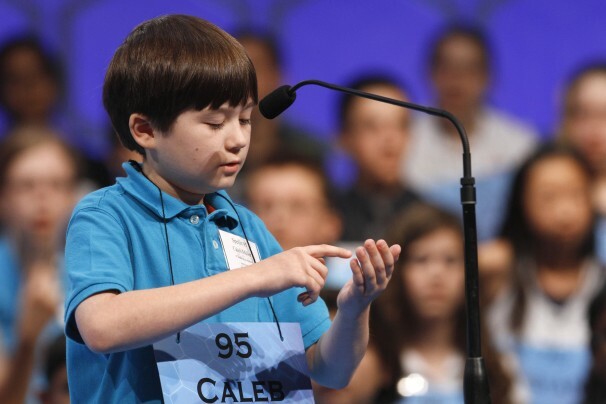 Over the years I learned the V-E-R-N-A-C-U-L-A-R and rules of each bee, and came to recognize that each spelling bee consists of three main groups of predators. The first, of course, are the spellers themselves. They are the weary eyed beasts that have put months, maybe even years into perfecting every last word they could get their hands on. They are not about to throw away a lifetime of missed play-dates and school dances to walk away without glory. The second group is the judges. They may seem like a couple of educators doing their job, but a slip up from them can result in a failure for the speller. The third and final category is probably even more T-R-E-A-C-H-E-R-O-U-S than group one and two combined. These are the parents. You will always have your common first-timers who will gladly walk away with 23rd place, but then there are the vipers. These parents will stop at nothing to get their kids to the top, even if it means clawing their way through thousands of dictionaries to find the name of that one dark cheese made from goats milk (G-J-E-T-O-S-T). To them, it’s win or nothing, and one threatening glare from them can send a spine-chilling storm of V-E-N-O-M-O-U-S fear across your whole body. But I am not afraid. Of course, it has taken years for me to reach this state of serenity, months of studying, spelling, and reading. Just about anything to reach what I am today. O-M-N-I-P-O-T-E-N-T. I never considered myself a typical speller. I actually won my first school bee by accident, having done no planning whatsoever. After that fortunate day, my parents were convinced that I had some sort of gift for spelling they called the “spelling sense”. Though I felt P-O-C-O-C-U-R-A-N-T-E about getting more involved, my parents coaxed me into it. Don’t get me wrong I studied quite intensely with the glorified idea of being champion keeping me focused. But over time that vision faded into something corrupt. Sitting at this regional bee, watching each speller mount the mike, hearing the heart-wrenching BING, it all seems like a broken record I have been hearing for too long. These bees have H-A-B-I-T-U-A-T-E-D me to classifying every word I see like a robot. Everything is a rhythm, and it is so engrained in my brain, I fear I may never be E-M-A-N-C-I-P-A-T-E-D from its hypnotic grasp. “Speller number 76” calls the woman on the microphone. I glance down at my plastered stomach and realize they are calling me, or rather my number. As I reach the microphone, I peer behind me and the other spellers remaining and notice that we all have the same bored expression on our tired faces. “Your word is Vivisepulture. ” The act of burying someone alive, I automatically think. Ironic. I take more time then necessary to spit out my answer. In the crowd, I see my father grinding his teeth anxiously and my mother eyeing the golden trophy. “Vivisepulture.” I say, grinning. Carefully taking each letter into account, I begin to spell. “S” I say to a collective gasp from the audience. “P-E-L-L-I-N-G-B-E-E-S. Vivisepulture.” I finish with a triumphant smile, and to my surprise, the spellers behind me erupt in applause. The audience roars with laughter as my parents quickly exit the room to hide their shame. The bell that once terrified me welcomes me off the stage as I glorify my accomplishment, realizing that I would rather have this feeling than any trophy. However, I know that while the other spellers were entertained, the competitive spelling sense will remain in their systems for many bees to come. But I still leave that bee with a sense of hope that maybe some kid watching this at home between four hour spelling sessions understands that life is more than just winning and spelling ridiculous words. Do all english teachers naturally raise wickedly good writers or is that some sort of gift? This post rocked! Teacher, writer, mother. Not necessarily in that order. I blog here and on Huffington Post.